CADWorx 2017 R1 Object Enabler for AutoCAD Released! The Intergraph Process, Power & Marine support team has posted CADWorx 2017 R1 Object Enabler. This enabler is now available for download from Intergraph’s Smart Support System. Select Free Software and Utilities. Select the download icon or the file link of the enabler. Note: Previous enablers can be uninstalled and substituted for this enabler. 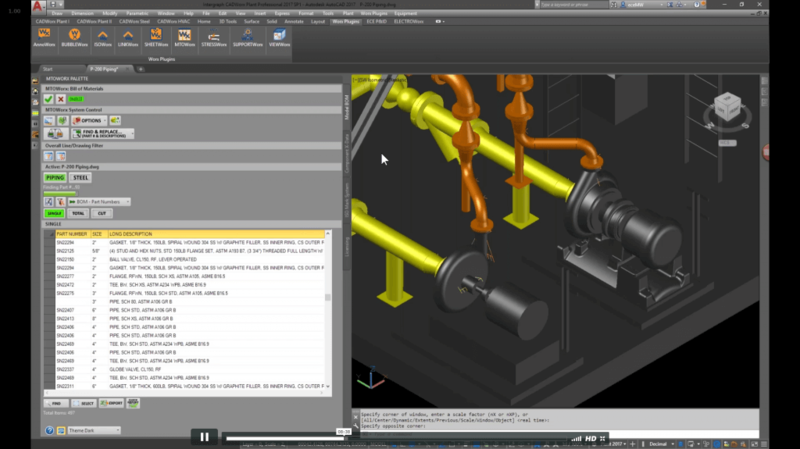 Recorded Webinar: MTOWorx for CADWorx has just been released! Recorded Webinar: MTOWorx for CADWorx – Data Integrity and Reports has just been released! Fix data mistakes before items make it to site. Rename line numbers, fix BOM items, change isogen data on multiple items at once. Cut customized inventory lists for each of your project owners. Export valve, instrument, component lists for both yourself and your clients. Use the BOM comparison tool to check item additions / deletions to active lines. PV Elite 2017 Service Pack 1 Released! The Intergraph Process, Power & Marine support team has posted PV Elite 2017 Service Pack 1. This Service Pack is now available for download from Intergraph’s Smart Support System. Updated PV Elite to correctly reference External Pressure Chart NFC-3 for material SB-466 H55. Fixed an issue in PV Elite in which the software did not correctly import certain saddle data from a customized SaddleData.xls file. The issue has been resolved, and the software now uses the correct conversion factor for customized saddle data. Fixed an issue in CodeCalc in which the What’s New icon on the Help tab did not link to the correct file. The issue has been resolved, and the What’s New in PV Elite and CodeCalc document now displays when you click the icon. Fixed an issue in CodeCalc in which importing nozzle data from PV Elite in the WRC 107/537 and WRC 297 modules caused the software to crash. The issue has been resolved and the Import Nozzle Data from PV Elite field now works correctly in the software. Fixed an issue in CodeCalc in which the software displayed an incorrect label for operating loads when performing an FEA analysis for WRC 107/537 & WRC 297 nozzles. Previously when you selected FEA in the Analysis Type field for WRC modules, the software did not update the Loads tab to indicate where to enter operating loads. The issue has been resolved, and the software now renames the Expansion section to Operating when you perform an FEA analysis. Fixed an issue in PV Elite in which the diagram on the Saddle Dialog displayed an incorrect designation for the Height of Web at Center. The issue has been resolved and the diagram no longer displays the Height of Web at Center designation. Fixed an issue in CodeCalc in which the software encountered an error when trying to load the structural data while performing a leg calculation. Previously, when you selected AISC Member Designation on the Vessel Leg tab, the software could not open the Structdata.txt file. The issue has been resolved and the software now opens the file so you can select a structural shape for legs. Fixed an issue in PV Elite in which the software did not retain PD5500 as the Tubesheet Analysis Method when analyzing a tubesheet. Previously, if you selected PD5500 as the Tubesheet Analysis Method and then closed and reopened the Heat Exchanger Tubesheet Input dialog, the software reset the Tubesheet Analysis Method to ASME. The software has been updated to retain your selection for Tubesheet Analysis Method. Fixed an issue in PV Elite regarding the Nozzle to Shell Groove Weld Depth limit. Previously, if you had a child nozzle attached to a parent nozzle, the software limited the Nozzle to Shell Groove Weld Depth to the thickness of the shell, even if the parent nozzle was thicker than the shell. The software no longer limits the weld depth based on the shell alone, but determines the limit based on the thickness of the element/detail to which the nozzle is attached. PV Elite no longer limits the nominal bolt diameter when you select User Root Area for Type of Threads on the Basering Dialog. Fixed an issue in PV Elite in which the software did not calculate the flange small end hub thickness for nozzles selected from the ANSI metric nozzle database. Previously, the software displayed calculations for the flange small end hub thickness for nozzles analyzed using Imperial units but did not display the calculations when analyzing using metric units. Fixed an issue in PV Elite in which the CrateRD field was incorrectly active on the API 579 Dialog when performing a Part 5 analysis according to the MAWP Approach. The CrateRD field only applies to the Part 5, Thickness Approach, so it was made inactive for the MAWP Approach to eliminate confusion. The tam_prev field now allows you to override the calculated value in remaining life calculations. Supplemental load values now correctly progress through the analysis. The software now correctly calculates the sum of the points for PTR data. The Rerated MAWP, Circumferential [MAWPrC] calculation now uses the correct tam value. Fixed an issue in PV Elite in which the software did not calculate the hydrostatic head pressure for the last element of a model with a skirt that was completely filled with liquid. The issue has been resolved and the software now calculates the hydrostatic head pressure for all elements in the model. Fixed an issue in PV Elite in which the software calculated an out-of-range value for the allowable compressive stress for certain vessels according to ASME VIII, Division 2. Previously, when analyzing a tubesheet according to ASME VIII, Division 2, if the shell side was in compression and the tubesheet material was not carbon steel, the software calculated a very high value for the allowable shell compressive stress. The issue is resolved and the software now calculates an allowable compressive stress value in the appropriate range. Fixed an issue in PV Elite in which the software incorrectly calculated the value for the longitudinal moment for lugs on a horizontal vessel. Previously, the software calculated the longitudinal moment by multiplying the values of the longitudinal shear and the Height from Bottom to Center of Hole (h). The software has been updated to calculate the longitudinal moment by multiplying the values of the longitudinal shear and the Offset from Vessel OD to Center of Hole (off). Fixed an issue in which PV Elite did not produce a Conical Section output report for models with a flange-cone-flange assembly. The software now creates the Conical Section output report for all models with a conical element. Updated PV Elite by removing the Required Area for Each Bolt, Based on Max Load and Area Available in a Single Bolt (Corr) calculations from the Basering Calculations output report when Neutral Axis Shift Method is selected for Method for Thkness Calc. and Analyze is selected for Basering Design Option. Fixed an issue in PV Elite in which the software displayed a different vessel weight on the Lifting Lug Calcs: Lift Lug and Element and Detail Weights output reports. Fixed an issue in PV Elite in which the software incorrectly calculated the value for Distance from Edge of the Head to the Edge of Nozzle or Pad L for certain nozzles on the Nozzle Calcs report. Fixed an issue in CodeCalc in which the Append Results icon did not function properly. Previously when you clicked Append Results, the software did not append the full output report. The issue is resolved and the software now includes the complete output report when performing the append function. Fixed an issue in CodeCalc in which the software showed an incorrect required thickness value in the external pressure calculations for a cone. Previously, the software calculated an incorrect TCA value in the Results for Maximum Allowable External Pressure section of the Conical Analysis report. The issue has been resolved and the software now displays the correct thickness value for cones. Fixed an issue in PV Elite in which the Area Available in Welds section of the Nozzle Calcs report displayed an incorrect substitution value for Wp. The software now correctly displays the Weld Leg at Pad OD value from the Nozzle Dialog as the Wp substitution value. Updated PV Elite to no longer use the Radial Top Plate Width value when calculating the required thickness of the gusset plate. The software has been updated to use the Average Gusset Plate Width value in the Required Gusset Plate Thickness calculations on the Basering Calculations report. Updated PV Elite by removing a warning on the Internal Pressure Calculations report that indicated the user-defined MAWP was greater than the computed MAWP for TEMA tubesheets. The warning is not applicable to the TEMA code and no longer displays when you analyze a TEMA tubesheet. Fixed an issue in PV Elite regarding the calculation of the vessel weight for vessels with sump heads and sump flanges. Previously, when your vessel contained sump heads or nozzles, PV Elite calculated differing values for the Fabricated Weight on the Element and Detail Weights output report and the Total Vessel Weight (No Liquid) on the Lifting Lug Calcs: report. The software has been updated to correctly calculate the same vessel weight in both instances. F/AWorx – Dumb name, we used STRESSWorx instead. DAMN,ITWorx – Built to emphasize the user to try the Worx plugins. Scrapped due to the heavy handed sales effect from advertising. JEFFWorx – Built to provide compelling(overwhelming) advice to the user, but scrapped due to the plugin swearing too much at the user. PANDAWorx – Made to show animated pictures of pandas while routing CADWorx Pipe. While initially successful in some global markets, the lack of product awareness forced us to stop development. CATWorx – Made to show animated pictures of cats while routing CADWorx Pipe. While initially successful with the Technical Support Manager at ECE, the lack of product awareness forced us to stop development. TIMEWorx – Made to take the entire Worx Plugin Suite, and install to the user’s computer in the past before installing their selves and realizing the benefit of the plugins. Scrapped due to causality effects in the timeline. And licensing issues. BROWorx – Built to encourage users to go to the gym and get “buff” during regular intervals from CADWorx. Users would be locked out their session and encouraged to enjoy the healthy benefits of physical activity. While initially successful with ECE’s Josh Travis, the lack of product awareness forced us to stop development. LUNCHWorx – Developed in the mindset that we could use StarTrek era holographic technology to beam users a cheese sandwich out of their disk drive when using the CHEESEME command in CADWorx. Scrapped due to most users not using an optical drive. 5MINWorx – Automatically sends an email, “Hey man, In 5 Minutes I got this,” when the plugin analyzes your work product, design speed, and general motivation and uses data heuristics to conclude that you do not have this in 5 minutes, in fact you probably don’t have this in a day, and when you finally do have to show something it will require multiple revisions to make it even applicable to the current project. Scrapped due to hardware sourcing to enable the motivation algorithm. DREAMWorx – Using state of the art Neuroprosthetics, we would utilize your dreams to enable CADWorx pipe routing from your mind directly, to remove travel times to work entirely. Scrapped due to too many dreams not about piping, and too explicit to discuss here. HUSBANDSTRESSWorx – Built to enable you to take your stress on your significant other and channel that energy towards CADWorx pipe routing. Scrapped due to the invasion of privacy concerns mostly. BOMWorx – Branding change to MTOWorx – due to the fact that we don’t want to say BOM in an airport. DATAWorx – Might actually happen but we have reserved the name for something excellent. JUSTWALKINANDPUSHABUTTONWorx – Was built to enable the user to just walk in, palm slam the keyboard, and get functional isos, orthos, and other project deliverables. Scrapped due to lack of product awareness. Who wants this?